Friedberg Unlisted (W-Unlisted). Act of January 28, 1847. 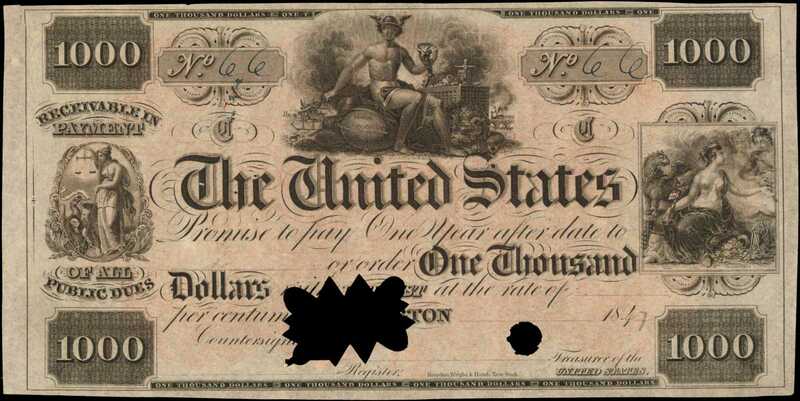 $1,000 Interest Bearing Note. PCGS Currency Choice About New 58. Remainder.Hessler-X114D. The Hessler, Chambliss Plate Note. Justice Scales, left. Mercury top center and Wealth, right. Impressive geometric lathe work at the back design with U.S. at center and flanking 100 counter. Penned 66 serial number and partial penciled date of 1847. Patterned hole cancel at bottom left center and adjacent hole cancel, right. Contemporary penned signature back right of center and small pencil annotation "D" circled in the lower right corner. PCGS Currency mentions "Small Edge Tear at Upper Left; Minor Mounting Remnants on Back" in the comments section of the holder. A significant item that features a pedigree to the John J. Ford Jr. Collection and the collection of Alexander Vattemare. It will certainly be a prized piece in any cabinet it enters.From Stacks sale of the John J. Ford Jr. Collection, Part VI, October 12, 2004, lot 421; Robson Lowe/Christies sale of the Vattemare Collection, April 2, 1982, lot 689.